The style, once confined to the margins of craft beer and in danger of earning the dreaded “historical” label, is booming with incredible offerings from talented brewers worldwide. Here at Revolution, the current Deep Wood Series is on track to release two Barleywines and two Ryewines within four months of each other – something we’d never have predicted three years ago. And that started, as a lot of things around here do, with the Repo Man soundtrack. Soon after our Brewpub opened, we decided to make a beer named after every single song on the classic “Repo Man” soundtrack, starting with Coup D'Etat Saison. In the winter of 2010, we conceived an English-style Barleywine called Institutionalized, named after the Suicidal Tendencies song. It was rich, smooth, and was overwhelmingly sweet from a higher finishing gravity. It warmed some bellies during our first winter, but our brewers thought it could be something even better. Before the stacks of barrels at the Kedzie brewery existed, there was what space we could find in the basement of the Revolution Brewpub. Barrel aging was the plan from day one, and we usually filled just two barrels each time we made a strong, dark beer. This experimentation formed the foundation of our barrel-aging program and in 2011 we finally had an inventory of aged beer to start releasing to the public. The Institutionalized Barleywine that we saved for aging finally saw the light of day at the Pub in September 2011. It came out dark-reddish brown, with huge hits of caramel, raisin, molasses, and butterscotch. It was, as our brewers put it, like drinking velvet in a glass. Our customers loved it, and considered the barrel character and balance a huge improvement. 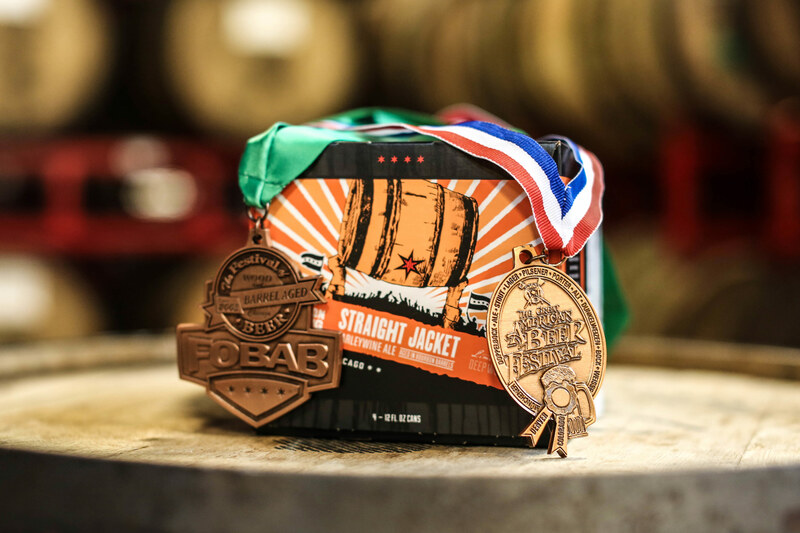 It was such a departure from the base beer that instead of just calling it Barrel Aged Institutionalized, we named the new barrel-aged version Straight Jacket. The second time we brewed the Barleywine for Straight Jacket, we then made the second runnings beer that became A Little Crazy. Everyone around the brewery was excited that we might be sitting on something big with Straight Jacket. They were right … eventually. When we opened the production brewery on Kedzie in 2012, Straight Jacket was the first beer put into barrels, and the first barrel-aged beer put into 22 oz. bombers there. Finally, we had more space to store barrels and release beers in to-go packages -- and that’s when the Deep Wood Series took shape as a barrel-aging program. There were about 50 total barrels filled with all brands at Kedzie in 2012 – a ways off from the 1,150 emptied for this season’s releases. Over the next few years, we kept making Straight Jacket, but it remained a smaller release and sat around in the market. Our brewers were undeterred, sticking with a beer they both loved and believed in. It won medals and blind tastings, and received a rare Cellar Selection rating (usually reserved for wine) from the Beverage Tasting Institute. We’d make sure to bring it to our biggest festivals–FOBAB, the Firestone Walker Invitational, Extreme Beer Fest–to get it in the hands of the most involved craft beer fans. We tried one-offs in different spirit barrels–one experiment being with the “DEAR JOHN” and “HI, THERE!” Cognac barrels that rest atop the barrel stack in our Taproom. “Of all the Deep Wood beers, I probably have the closest emotional connection to Straight Jacket,” Scott said. Last year, everything started to pay off–whether through changing tastes, hashtag-based Barleywine hype, or a combination of other factors. At our release party, people turned out in droves to bring home four-packs of the newly-in-cans Straight Jacket. Coincidentally, 2018 was our brewers’ favorite version of Straight Jacket yet, and formed a big part of the 2018 V.S.O.J. that sold out in three hours at our brewery release in October. It also added some more hardware – pulling a bronze at both the 2018 Great American Beer Festival and the Festival of Wood and Barrel Aged Beer. NOW IT’S JUST ABOUT TIME FOR 2019 STRAIGHT JACKET. IT’LL BE DIFFERENT FROM 2018– WHICH IS A GOOD THING, BECAUSE ONE OF THE BEST PARTS OF STRAIGHT JACKET IS THAT IT’S ALWAYS EVOLVING. Join us on January 18 to see the next chapter of Straight Jacket unfold. Come live the Life with the Rev Brew team and see what bold American oak can do for a tasty English Barleywine.